Eufy’s RoboVac 11 has been a favorite among robot vacuum users for quite a long time now. 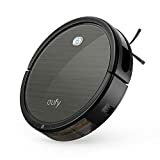 So it’s not exactly a surprise that people have been going nuts over the newly updated version, the Eufy RoboVac 11+ Robot Vacuum Cleaner. It’s gotten a bunch of great upgrades compared to the original, and it even launched at $250, which is $10 less than the original model costs. But why pay $250 when you can snag one right now on Amazon for just $179.99, an all-time low? Definitely pick one up on sale while you still can — you won’t be sorry.